TAASRO's definition of School Resource Officer: Alabama SRO: An APOSTC law enforcement officer under the direction of a law enforcement agency who is specifically selected and specially trained for the school setting. Find out more about being a sponsor and sign up today! More information at the conference!!! 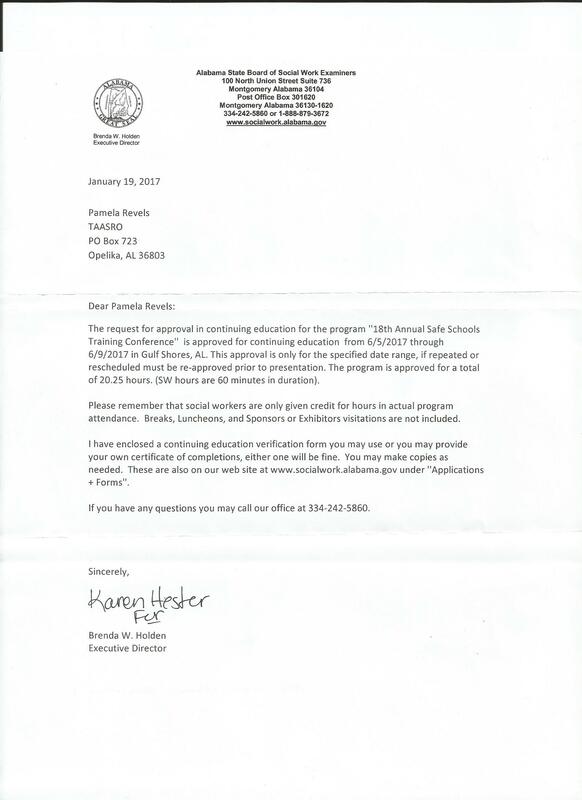 Alabama State Board of Social Work Examiners has approved 20.25 CEU hours. Click on the link below to view the letter. A verification sheet will be provided at the conference. This is a class taught by SROs trained in Active Shooter Response and will be held in a school setting. There will be a classroom lecture and hands on training with simunition equipment. Attendees will be equipped with the proper safety attire and equipment needed to safely perform the training scenarios. Scenarios will place the administrator/SRO into the stressful duty of the responding officer responding to an active shooter and will allow you to see the importance of training preparation and the split second decisions to shoot or don’t shoot. Refreshments and a scheduled working lunch will be provided at the training location on those days. Classes are limited to 20 students on each day and classes will be held from 8:30 AM-12:00 PM dates are TBA. Class will require participants to engage in physical activity. Attendees will be placed into classes on a first come first served basis. Classes will be taught by certified trainers in active shooter response. There is an opportunity to register for this course when filling out the registration for the conference. Participants must attend the conference sessions June 6- June 10, 2016 in Gulf Shores, Alabama. These sessions are led by the leading experts on school evacuation, reunification and recovery. Participants will then document 30-35 hours of implementation of techniques and training in their particular workplace. Participants must also attend a minimum of two TAASRO board meetings during the next school year and communicate the information gleaned from these meetings to their district electronically. This will serve as documentation of the participant performing this task. The conference will be held in Gulf Shores, Alabama. TAASRO board meetings are held at different locations throughout the state to make availability more accessible. All school districts in the state of Alabama are eligible. One PLU can be earned upon successful completion of said requirements. This study will be offered one year. Objectives: The Purpose of this study is to better prepare educators to be able to adjust, reorganize, and assist other faculty members, students, and all stakeholders after the occurrence of a school emergency such as a school shooting, bomb, train wreck, catastrophic natural disaster, loss of a student, faculty member, family member or significant community leader.